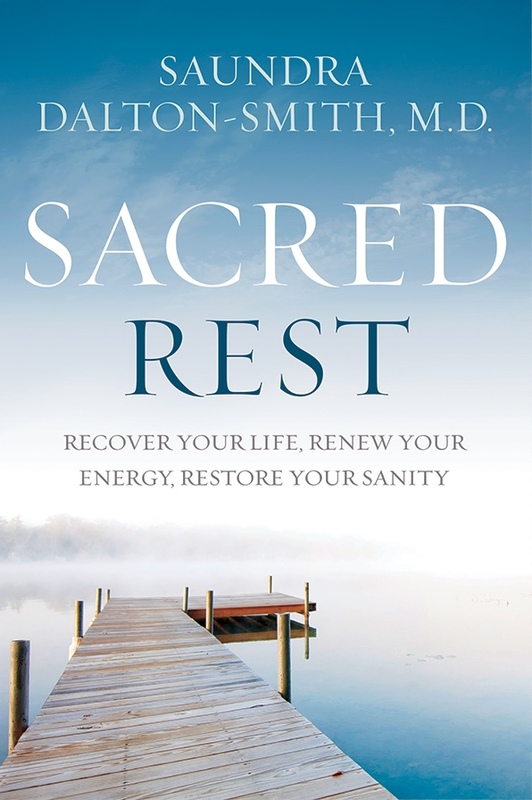 You are here: Home / Emotions / Worry Steals Rest—Big Time! 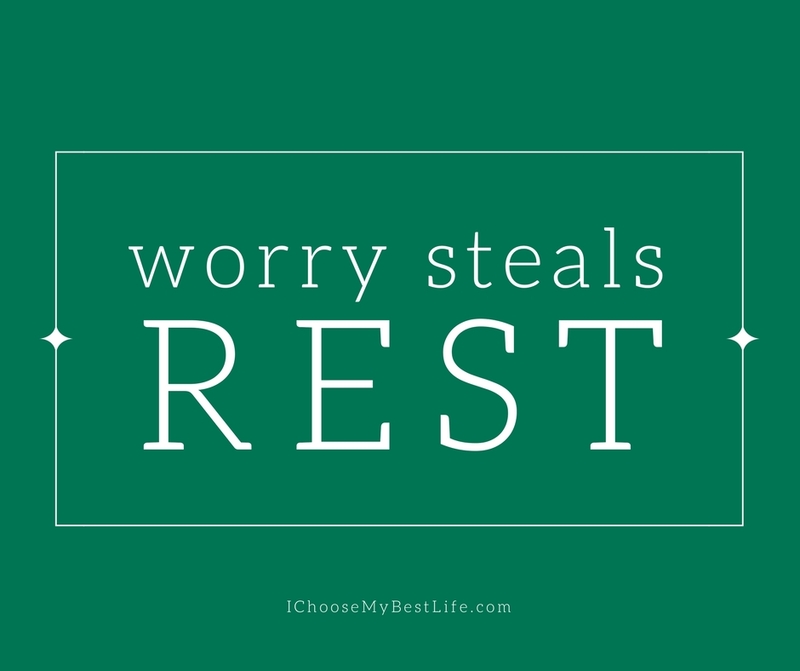 If you struggle with worrying but long to find true, life-giving rest, I invite you to read this guest post by my friend Kathy. It’s important that we replace lies with Truth that help uproot worrying. Yet somehow worry seems to assure us we’re going somewhere—even to a place of rest. But soon after we realize we’re the farthest away from peace we can be. We’re actually stressed out! So why does worry seem so inviting to begin with and what can we do about it? What Lies Cheer for Worry? Any number of lies in our minds motivate us to distrust God, slide into worry and steal our rest. Here are some. Worry is “normal,” a part of being “human,” therefore it’s beyond our control. It may be true worry is natural and “being human,” but it’s not beyond our control. As Christians, God provides the power to live supernaturally and resist our fallen human nature, though often imperfectly. God provides everything we need to live a godly life (2 Peter 1:3) to his glory. “A little worry” is acceptable. But when is it “too much”? Romans 14:23 says, For whatever does not proceed from faith is sin. “Whatever” means everything, big or little. Philippians 4:6 exhorts us, do not be anxious about anything, but in everything by prayer and supplication with thanksgiving let your requests be made known to God. Did you notice “anything” and “everything”? There’s no “a little worry is acceptable.” God invites us into rest by helping us see that anything of distrust brings confusion and uncertainty. It’s not good for us and He wants the best for us. If I worry, I’m hopeless. Satan whispers, “You said you wouldn’t worry anymore but you keep doing it.” But any and all sins can be forgiven. Our repentance draws us back to trust in God’s gracious heart. We’ll then grow in strength to resist the temptation next time, knowing there is always the peace that comes from forgiveness. What Heart Commitments Motivate Worry? But there’s more in our hearts that might contribute to the distress of worry. Here are four ideas we might even realize is rooted in our thinking. Worry helps me feel like I know what’s best. I personally don’t like feeling like I’m not smart. Every time we worry, we’re basically saying we know better than God. My friend worries constantly about her children. She believes any difficulty is not good for them. Her worry, which she calls prayer, tells God what to do. She experienced very painful things in her childhood, so she wants to convince God challenges aren’t good for her children. But James 1:17 assures us, Every good gift and every perfect gift is from above, coming down from the Father of lights with whom there is no variation or shadow due to change. Worry helps me feel powerful. I don’t like feeling out of control. I grew up hearing, “Why, of course worry works. What I worry about doesn’t happen.” It’s a humorous saying but it shows how we’re trying to impotently control circumstances rather than trusting the most powerful potentate there is. The next time you are tempted to worry and risk distress, ask God, “Am I demanding my own way to feel powerful?” Many of us grew up feeling voiceless. Feeling powerful seems to demand we be heard. Worry helps me feel included. I don’t like feeling left out. 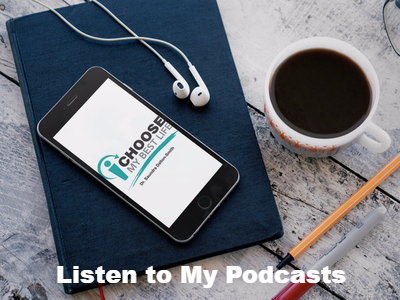 When something threatening occurs to those I love and I’m not being included, Satan whispers, “I guess they don’t think you’re very important.” I can text or email and say, “I was worried about you,” with the hope they’ll respond. We’re depending upon another for what God wants to provide. As a result, we don’t experience peace and joy. Worry helps me feel helpful. If you can identify with any of those motivations, remind yourself, like rocking in a rocking chair, you don’t go anywhere—except to tension and anxiety. Pay attention to what’s motivating you and consciously rehearse God’s faithfulness, power, and sovereignty. He is big enough to fight for you. No need to worry. He knows exactly how He intends to bring good for you and glory for Himself. Stop rocking in that rocking chair. Which lie or heart commitment do you struggle with most often? Do you want a purer passion for serving God and to respond with greater godliness as a result? 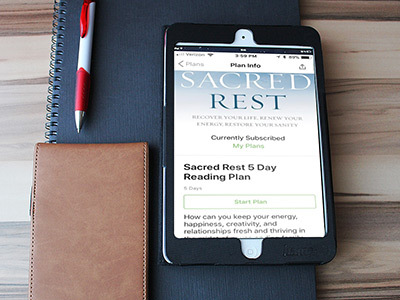 Pure-Hearted will inspire you to focus on desiring God’s glory and enjoy the benefits without guilt—benefits like selflessness, security, satisfaction, surrender, stability and self-control, along with others. 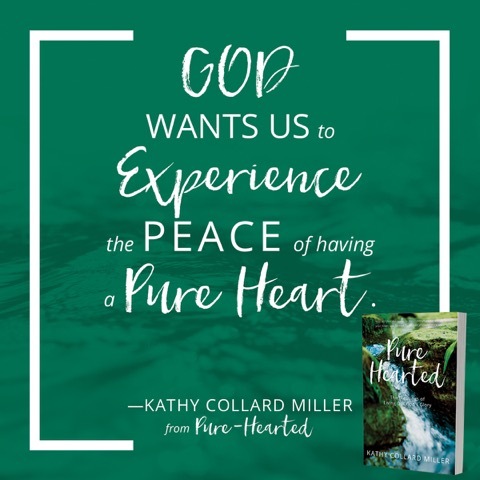 Kathy Collard Miller is an award-winning author of over 50 books that include Christian living topics, women’s Bible studies, and Bible commentaries. 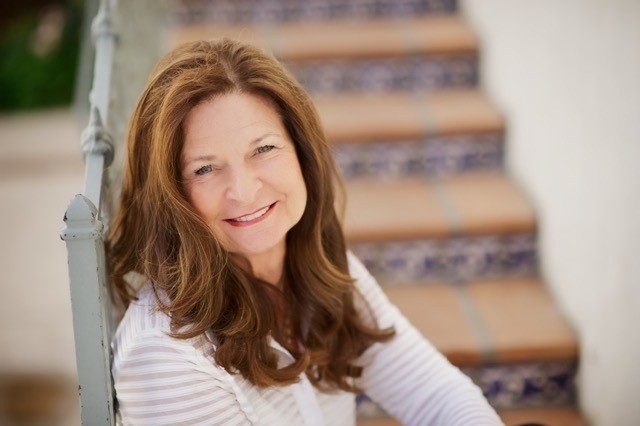 She is a speaker who has shared in 8 foreign countries and over 30 US states. Kathy and Larry have been married for 47 years and are the parents of 2 and grandparents of 2. They live in Southern California and often write and speak together. 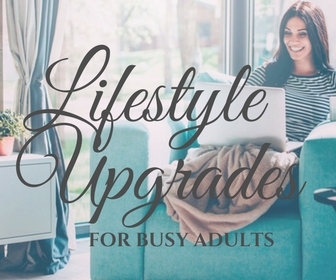 Visit her at www.KathyCollardMiller.com or follow along on Facebook, Twitter, or Pinterest. She would love to hear from you. Saundra, thank you so very much for sharing my guest post and for alerting your readers to my book. 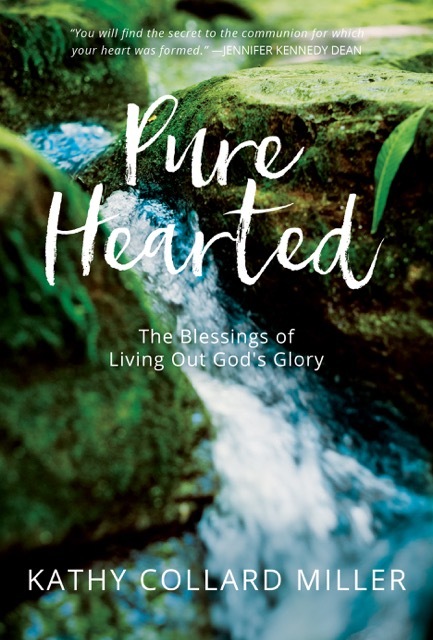 I’m looking forward to sending an autographed copy of “Pure-Hearted” to the winner of your drawing. God bless you and keep up the great work bringing glory to God and equipping His family. Happy to do so Kathy! Blessings to you! My mother was a consummate worrier. I used to joke that even if there was nothing about which to worry, she would make something up. I learned the habit from a master. I also have come to realize that it has become a habit that I have allowed to become ingrained in me. The way in which you have broken it down above, pointing out where I am believing a lie instead of God, and your suggested counter steps have given me tools with which I can work to overcome an almost 6 decades long habit. Thank you! Nancy, thank you so much for commenting and for sharing how you applied my comments–and the Lord’s truth. I’m so encouraged and grateful to know the Lord made it applicable for you. We certainly can be influenced by “bad” models of something like worry. So good for you for allowing the Lord to make a change in your life. Thank you again! Thank you Marie for sharing the book with your friends!